Boss Cam Lock Advance Guardrail Scaffold. UK Delivery. 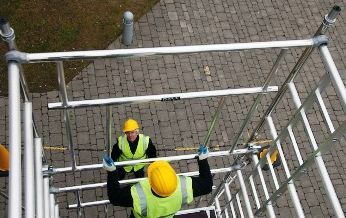 Next time you hire a scaffold tower try the Boss Cam-Lock Advance Guardrail Scaffold system. It provides a faster safer build method for BoSS Ladderspan towers. Available in 1.8 and 2.5m lengths. The traditional way to build scaffold towers has always been with the red and blue brace system using the “through the trap” or 3t method or with an advanced guardrail. This has been consistent for many years across almost all scaffold tower hire companies. This year Youngman’s have offered a new safer and quicker way. It’s basically a hybrid of the brace system and the guardrail. Youngman’s have designed an advanced guardrail section that now attaches on the scaffold towers as it is erected and replaces the red and blue braces. This eliminates the situation where a contractor is sitting on an unguarded scaffold tower platform. Also due to the reduction in components it speeds the erection of the tower. Safety – guardrail in place before user ascends the platform. This helps companies comply with main contractors demands for an advance guardrail system. If you have any doubts please call us. Also consider this AGR system. Using standard scaffold tower equipment and all the many add-ons available is without doubt, the safest way to tackle working at height in the construction industry. It gives you ultimate peace of mind and security which is essential when working on construction sites where health and safety is paramount. But what about the actual physical act of putting a scaffold tower? Using the red and blue brace system and the ‘through the trap’ or 3ft method has been standard practice across nearly all scaffold tower hire companies for some time, but now there is a safer, faster build method on the market. The Cam-Lock Advance Guardrail system offers a quicker, more secure construction for BoSS Ladderspan towers. Assembly and dismantling scaffold towers has never been easier thanks to this new hybrid of the brace system and the guardrail which has been specially designed for the job by Youngman’s. It consists of an advanced guardrail section that simply attaches to the existing scaffold tower and replaces the blue and red braces. This means, because there are fewer components involved, the tower can be erected super-fast and construction professionals will never be in the situation where they are left sitting on an unguarded scaffold tower platform. There are so many benefits to the BoSS Cam-Lock Advance Guardrail. It has an easy-to-use method so even beginners can get to grips with it quickly and efficiently. The Advance Guardrail (AGR) frames are less prone to be lost or damaged than the brace system because it contains fewer components. The frames, which provide lightweight tower rigidity, are also available in 1.8 and 2.5m lengths. The concept of AGR is one of two HSE-approved, and PASMA endorsed, methods of ensuring collective fall-protection (guard railing) is in place making the use of scaffold towers and working at height safer than ever before. Users also benefit because there is less chance of components going missing. For example on a 2.2m scaffold tower hire using a brace system there are 14 components plus wheels, for a Cam lock system this reduces to just 7.